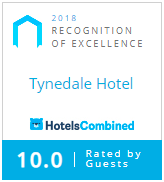 Tynedale Hotel has been recognised as a finalist at this year’s National Coach Tourism Awards. The awards, held last night in Blackpool’s Tower Ballroom, and organised by trade magazine Coach Monthly, recognises excellence and innovation across coach tour operators, tourist destinations and attractions, and industry suppliers. Tynedale Hotel was a finalist at the national tourism awards. The awards presentation was hosted by the editor of Coach Monthly magazine, Stuart Render, and ex EastEnders actress and television presenter Brooke Kinsella MBE. The evening’s entertainment was provided by West End actress and singer, Jodie Prenger. A town, city, region, island, or country that has demonstrated a commitment to welcoming coaches, coach groups, and coach drivers. A visitor attraction that demonstrates a commitment to welcoming coaches, coach groups, and coach drivers . A shopping destination that demonstrates its commitment to quality and innovation, as well as welcoming coaches, coach groups, and coach drivers. A cross-sea carrier, above and below sea, that demonstrates a commitment to quality and innovation, as well as welcoming coaches, coach groups and coach drivers. A hotel group or chain that demonstrates a commitment to quality and innovation as well as welcoming coaches, coach groups and coach drivers. An individual hotel that demonstrates a commitment to quality and innovation as well as welcoming coaches, coach groups and coach drivers. A ticket supplier that demonstrates a commitment to quality and innovation as well as an understanding of the needs of, and a commitment to working closely with, coach tour operators. A tour wholesaler that demonstrates a commitment to quality and innovation as well as an understanding of the needs of, and a commitment to working closely with, coach tour operators. Entry was open to any UK coach operator that operates a programme of coach holidays. The judges were looking for a programme that demonstrates innovation and creativity, and that ‘special something’ that makes the programme stand out. Entry was open to any UK coach operator that operates a programme of day excursions. The judges were looking for a programme that demonstrates innovation and creativity, and that ‘special something’ that makes the programme stand out. Entry was open to any UK coach tour operator that produces a printed coach holiday brochure. The judges were looking for a brochure that has a professional appearance, is well laid out, easy to read and reflects the quality of the operator. With the general quality of brochures now at a uniformly high level, the judges were also looking for that ‘special something’ that helps a brochure stand out. Entry was open to coach tour operators, and coach tourism businesses that have used innovation to to help deliver business success. Entry was open to any business or organisation involved in delivering coach tourism. The judges were looking for initiatives that demonstrate a commitment to reducing the carbon footprint of the business or organisation. Entry was open to individuals or team working for a coach tour operator, supplier, destination or organisation within the coach tourism community. Entrants had to be nominated. Entry was open to any coach driver who is primarily employed on coach tour duties. Entrants had to be nominated. For the next three categories the judges were looking for a coach tour operator that demonstrates a commitment to quality, innovation and training, and has an excellent industry reputation. Fleet to be fewer than 5 coaches. Fleet to be between 5 and 15 coaches. Fleet of 15 or more coaches. Awarded in recognition of an outstanding contribution to coach tourism.